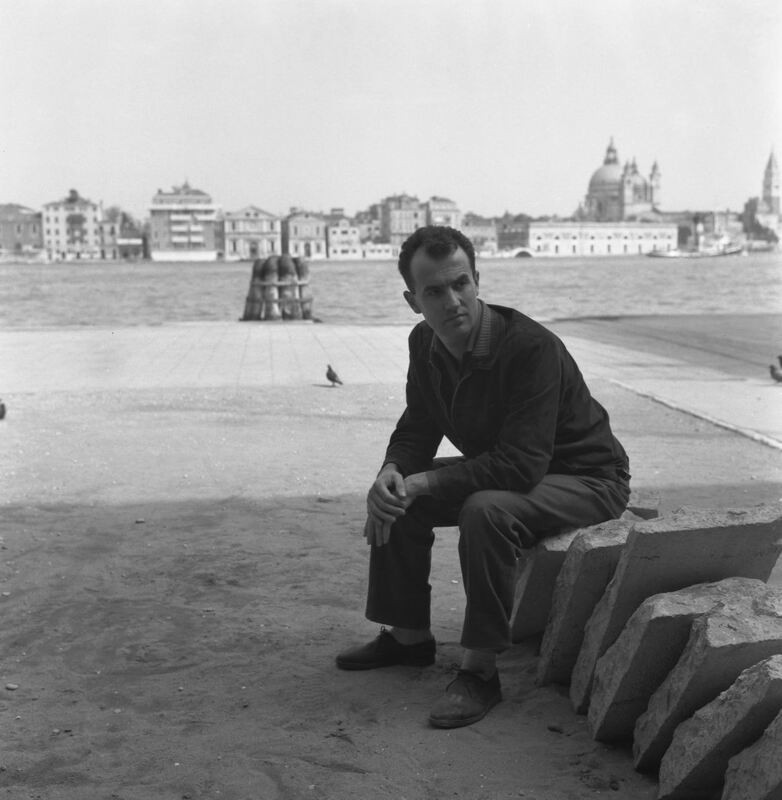 Luigi Nono (Venice, 1924-1990) was one of the most important Italian composers of the twentieth century, whose compositions often made ​​use of electronic instruments, including the computer. The first thing to point out to the Venetian composer is certainly relative to a training course rather interesting. Although it is true that his path of musical training began approximately in 1941, with courses taught by Malipiero composition at the Conservatory of Venice, as external student, it is equally important that around 1949 Luigi Nono took the final decision to end his career as a student. 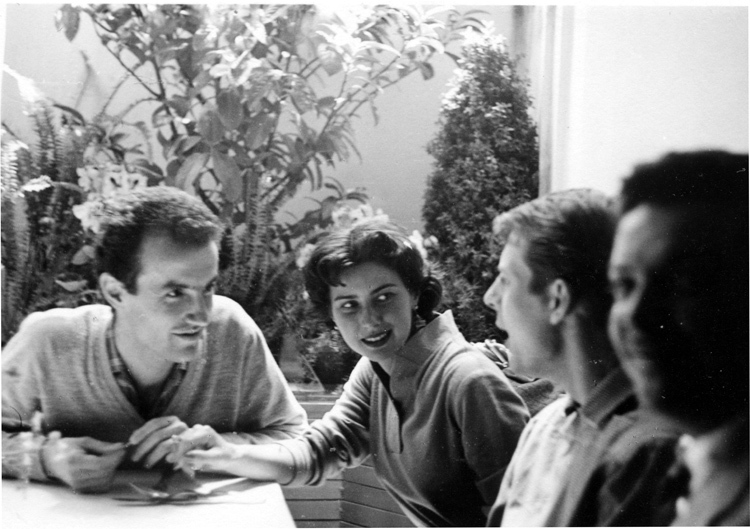 A beautiful image that depicts Luigi Nono with Nuria Schoenberg, the daughter of the German composer, who he married in 1955. Of the other two characters, judging from the profile, the second should be a young Karlheinz Stockhausen. Here then is the musical training of Nono took place according to a process that was different. For the Venetian composer became fundamental lessons taken privately with some of the other protagonists of the music of those years, including Gian Francesco Malipiero. 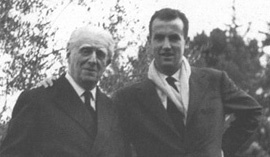 Blurry image that depicts the composer Gian Francesco Malipiero together with Luigi Nono, who was his pupil. No less important was the meeting with two other personalities: Bruno Maderna and Hermann Scherchen. Regarding the first, we can say that it was a relationship in some respects anomalous, in the sense that Maderna was essentially a contemporary of Nono (Maderna was born four years before Luigi Nono) nevertheless stated in the music scene and became a reference point for Nono, a real life master. 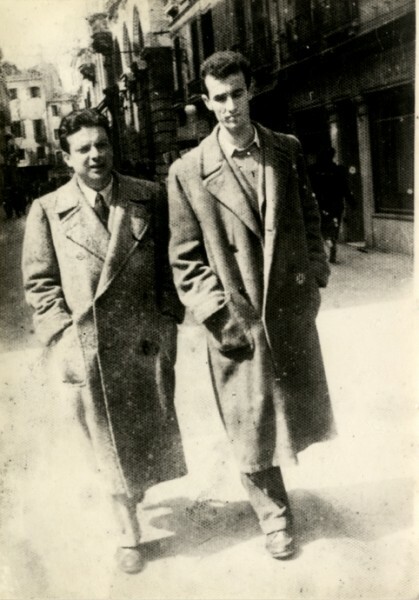 Bruno Maderna and Luigi Nono walking in Venice, 1948. Equally important, as a reference point for a career in music by Luigi Nono, it was the German conductor Hermann Scherchen who forced him to further his music studies of the great past composerssuch as Bach and Beethoven, but without neglecting the new instances of contemporary music, urging him to investigate the twelve-tone technique, the study of Schoenberg, Webern and Dallapiccola. In addition, Scherchen invited him to take part in the Darmstadt summer meetings, where for many years they found most of the greatest composers of the twentieth century: Karlheinz Stockhausen, Pierre Boulez, Henri Pousseur and John Cage and many others . 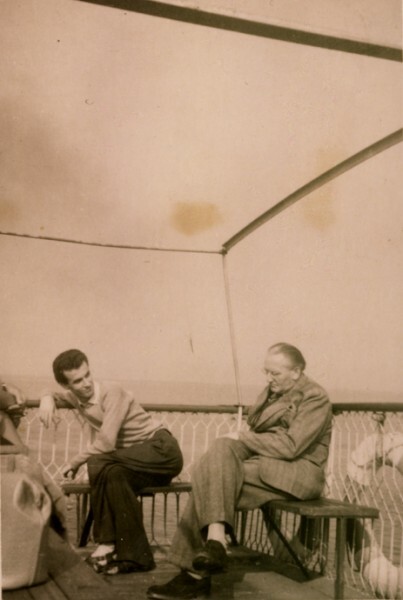 A picture of Luigi Nono and Hermann Scherchen, Venice 1948. 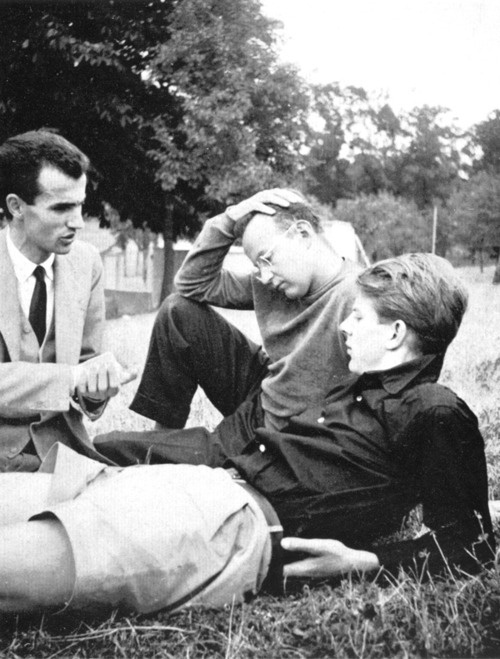 Luigi Nono, Karel Goeyvaerts (at center) and Karlheinz Stockhausen in relaxation, presumably in Darmstadt. 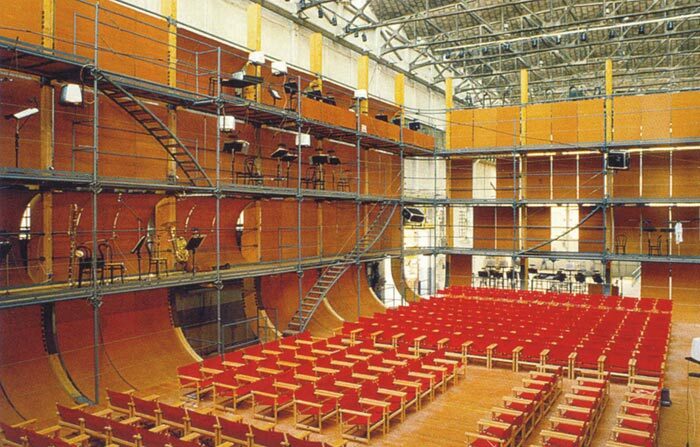 The environment of Darmstadt for Luigi Nono was a source of great stimulation, and it is reasonable to think that the stimuli from that environment helped to bring Nono to electronic instruments, which the composer lived as a way to renew the musical language and its aesthetics. 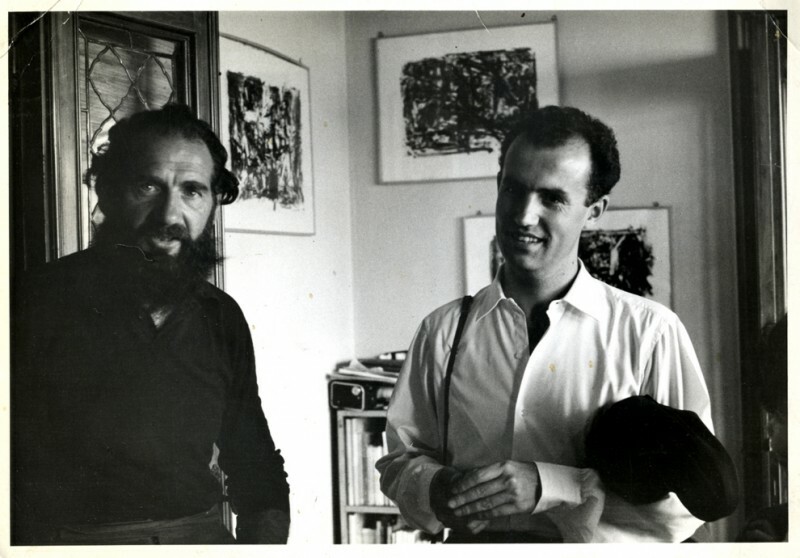 What is certain is that since the sixties, Luigi Nono began attending the Studio di Fonologia RAI in Milan, where in 1960 he composed his first electronic work: Omaggio ad Emilio Vedova. Marino Zuccheri and Luigi Nono at the Studio di Fonologia Rai in Milan, Sixties. 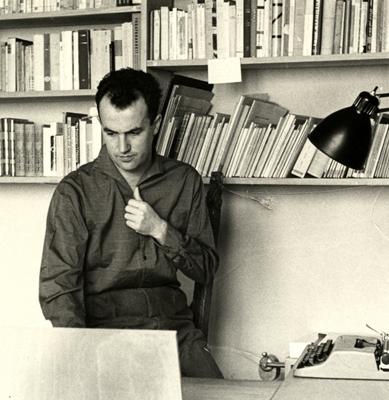 Luigi Nono experimenting with the tools of the Studio di Fonologia RAI, in the sixties. The collaboration between Luigi Nono and the Studio di Fonologia in Milan was quite long, and is not exhausted by a supervening lack of interest by the Venetian composer, rather because after twenty years, the Studio in Milan became obsolete, and for this reason Luigi Nono began to be interested in another center where create new works of electronic music, which is why since 1980 Nono began collaborating with the Experimentalstudio der Heinrich-Strobel-Stiftung in Freiburg. Most likely, but I’m not sure, this is a picture of the Experimentalstudio der Heinrich-Strobel-Stiftung in Freiburg, in 1979 approximately. 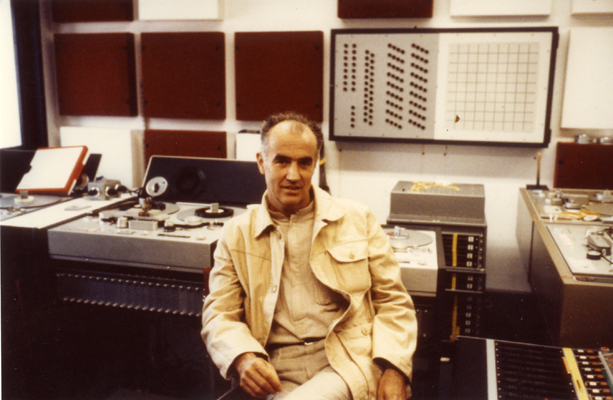 Another picture of Luigi Nono at the Experimentalstudio der Heinrich-Strobel-Stiftung in Freiburg, 1971. 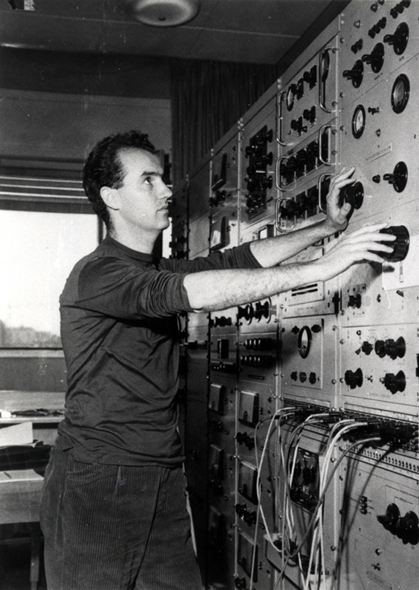 After some years, with the improvement of electronic equipment, Luigi Nono began to experiment with the use of tools for sound processing in real time. 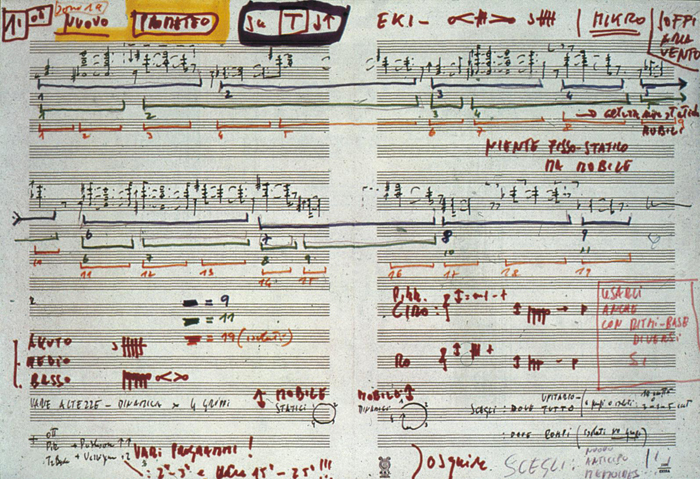 In this way, the Venetian composer became interested in the possibility to use the computer to compose some work, as it emerges from the correspondence between Luigi Nono and musicologist Massimo Mila. In the meantime, in 1979 born formally, the Centro di Sonologia Computazionale (Center for Computational Sonology) in Padua, the first Italian research center dedicated to computer music. Nono began to consider use of computerized tools to complete a work which had long been was working in collaboration with the philosopher Massimo Cacciari: il Prometeo. 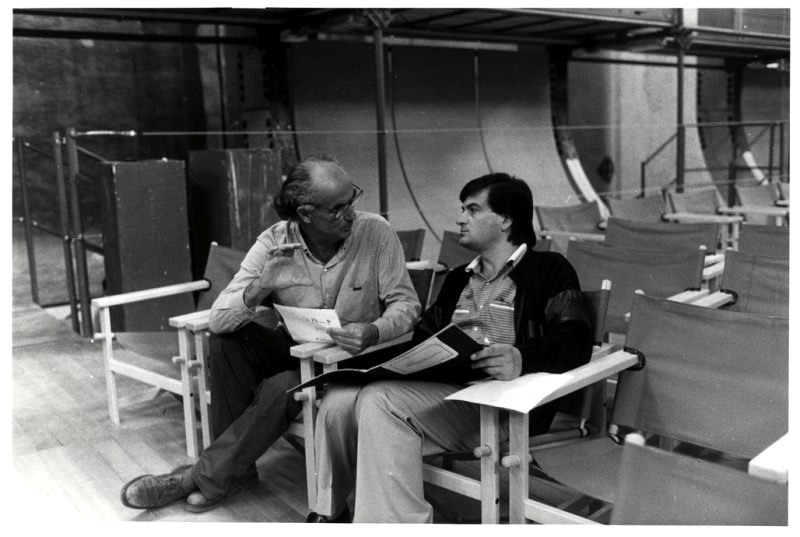 Massimo Cacciari and Luigi Nono, Venice 1983. The Prometeo is a great work, innovative and atypical. It belongs to the theatrical genre but certainly makes it difficult to circumscribe it in a very specific context. The technical information tell us that the work was carried out between 1981 and 1984, until the final version of the 1985. 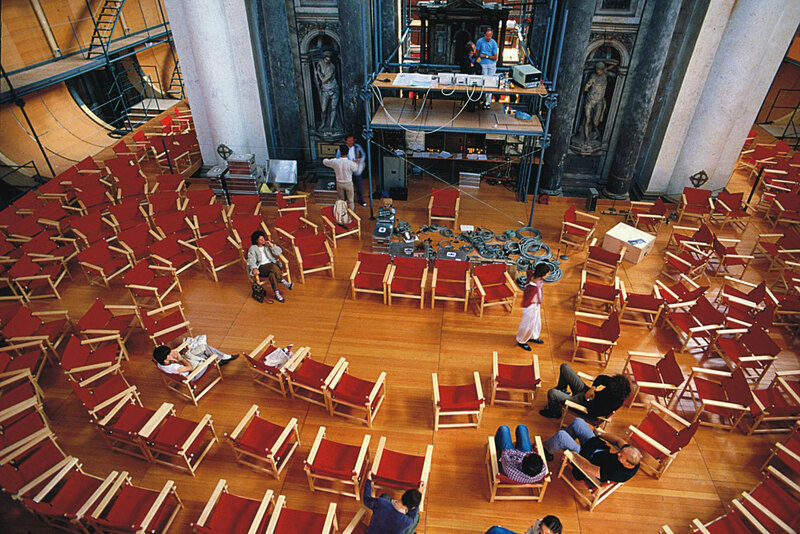 The text of the book, edited by Massimo Cacciari, bind to the music of Luigi Nono and the immense scenery designed by architect Renzo Piano, with bright interiors interventions by Emilio Vedova. 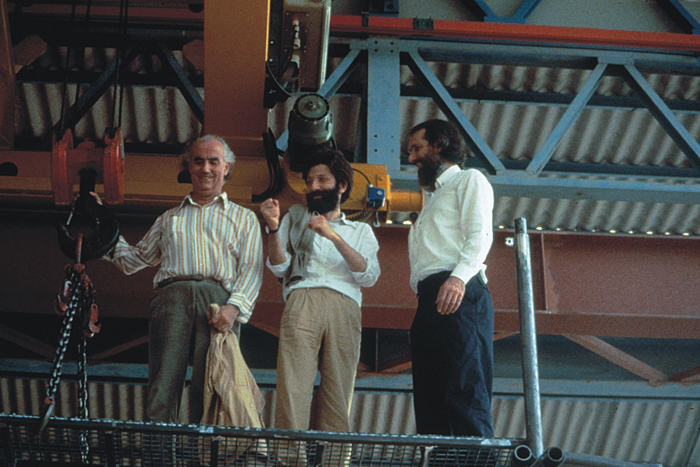 Luigi Nono, Massimo Cacciari and Renzo Piano at work for the Prometeo’s scenography. 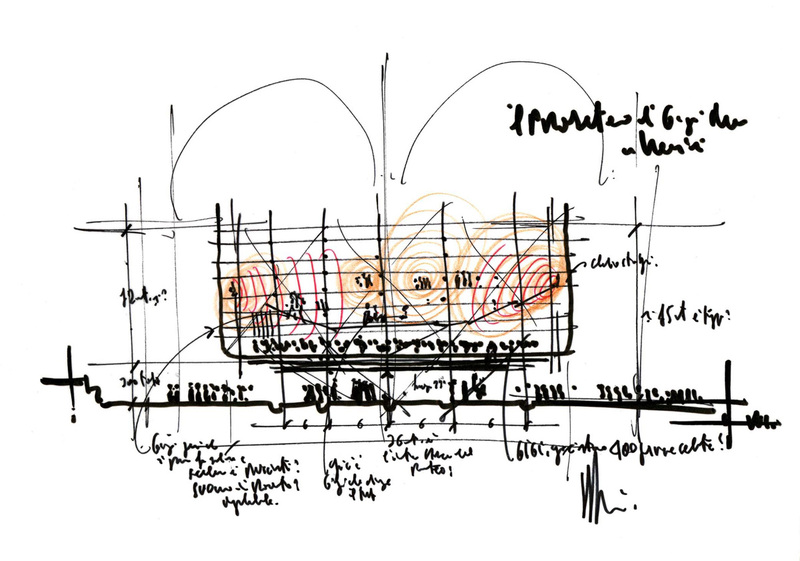 A draft of the project by Renzo Piano for the set of Prometheus. An image from above during construction. The overall image of the stage space and stage design. 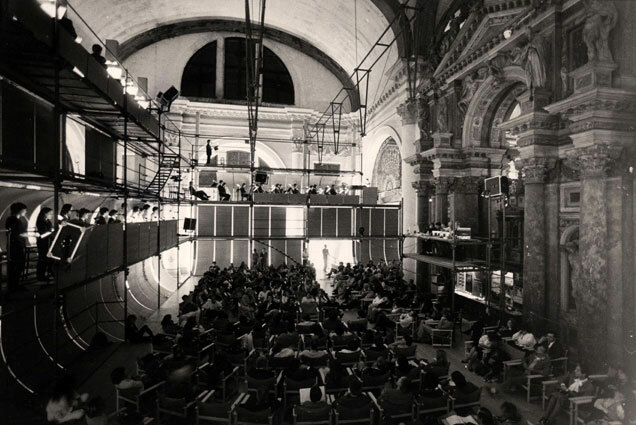 The first performance of the Prometeo at the Church of San Lorenzo. Venice, 1984. 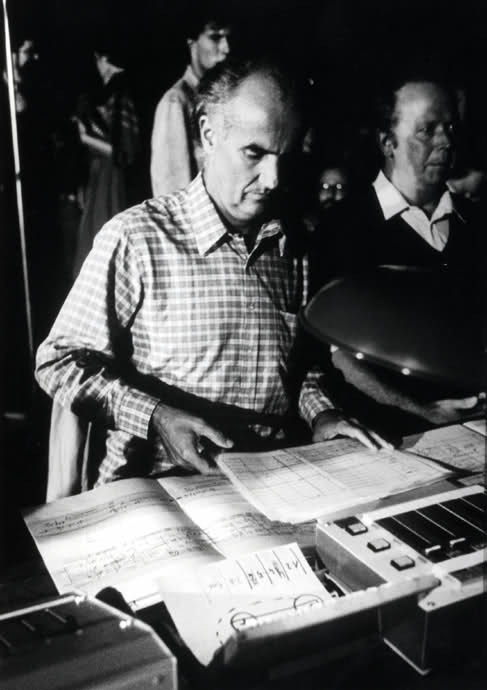 For the realization of electronic materials through the computer was fundamental for Luigi Nono the collaboration with the staff of the CSCC in Padua.. 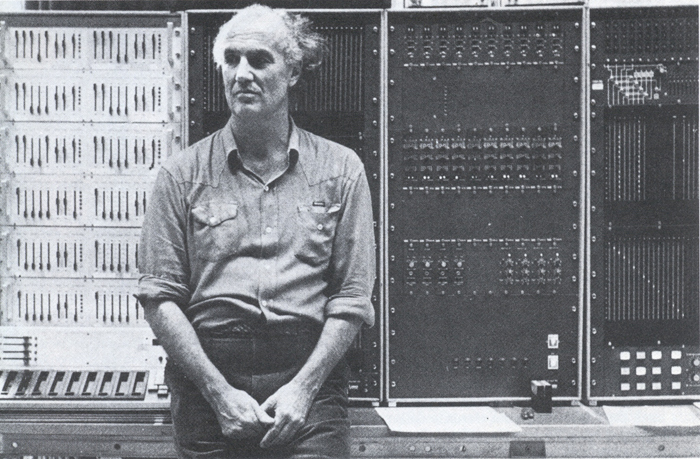 Among them is certainly important to remember Alvise Vidolin, whose importance for computer music in Italy is evidenced by a recent book dedicated to him. 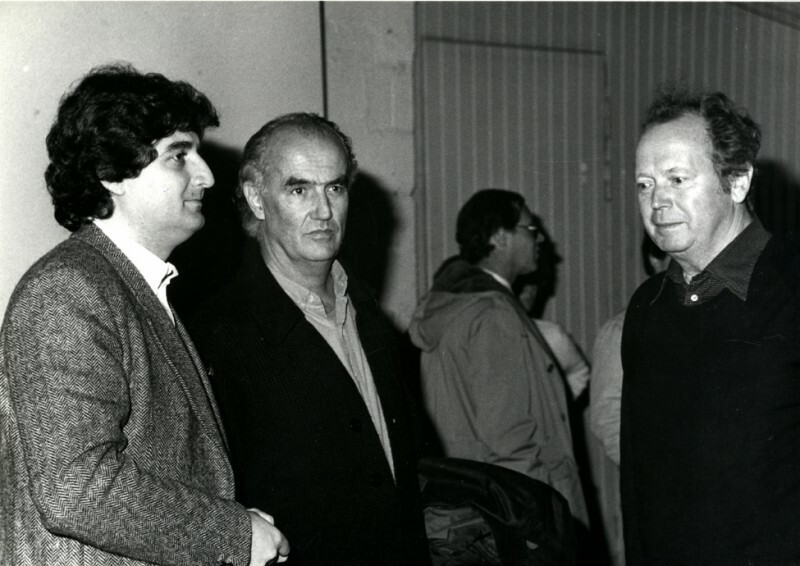 Alvise Vidolin, Luigi Nono and the German composer Hans Peter Haller. The latter is dealt with Nono’s sound direction. Donaueschingen, 1982. Luigi Nono along with some employees of the CSC. 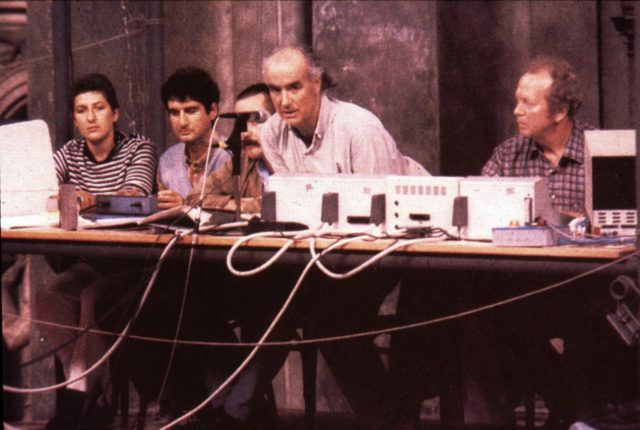 From left: Sylvian Sapir, Alvise Vidolin, Andreas Breitscheid, Luigi Nono and Hans Peter Haller. Venice, 1984. 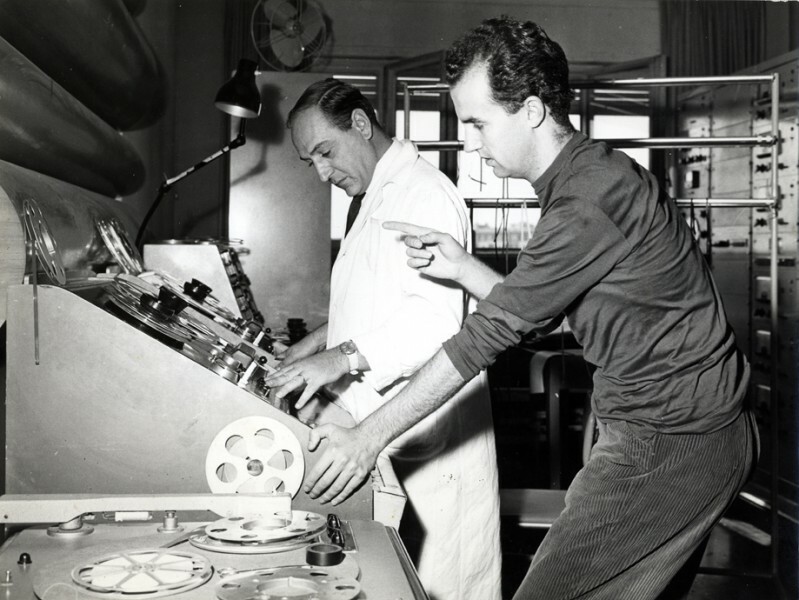 Luigi Nono and Roberto Fabbriciani on the seats of the Prometeo. Draft score of the Prometeo. If Alvise Vidolin was a professional essential to the realization of Prometheus, a few words should be said also for Hans Peter Haller who for many years was a trusted collaborator of Nono as sound director, alongside the Venetian composer. 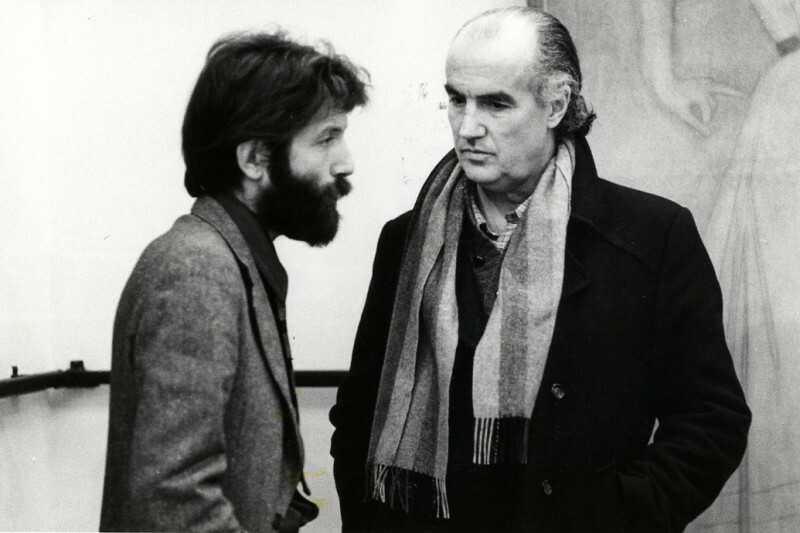 A picture of Luigi Nono who portrays him, I think, next to Hans Peter Haller, probably on the occasion of a performance of Prometheus. 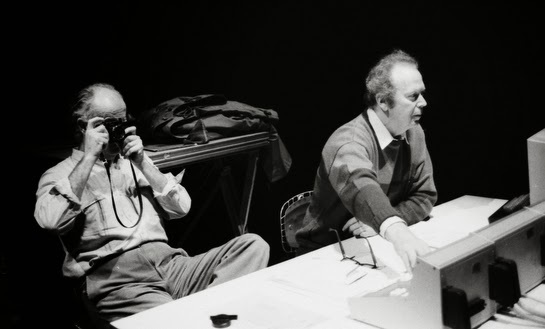 Still image of Luigi Nono and Hans Peter Haller. I do not remember where I read that this photo was taken at Ircam in 1985, but I have some doubts about the veracity of that caption. 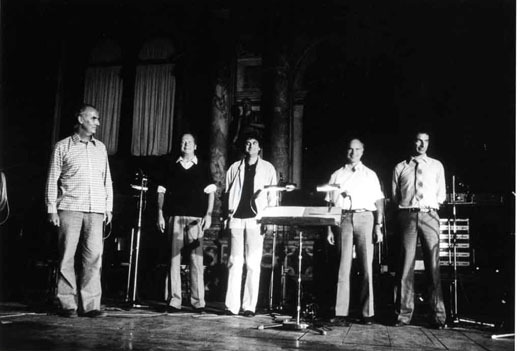 October 3, 1982, Luigi Nono, Hans Peter Haller, Alvise Vidolin, Rudolf Strauss and Bernd Noll at the Scuola Grande di San Rocco for the International Festival of Contemporary Music in Venice, I do not know the performance. 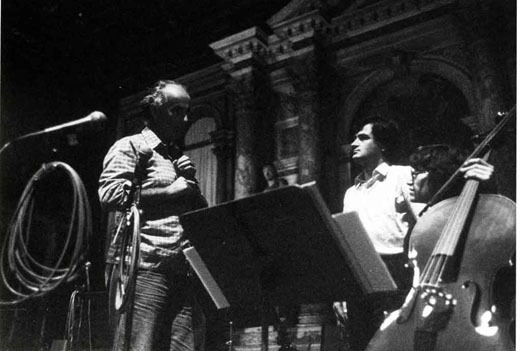 Luigi Nono, yet at the Scuola Grande di San Rocco, with Roberto Fabbriciani and Marie France Uitti. Venice, 1982. One last picture together. 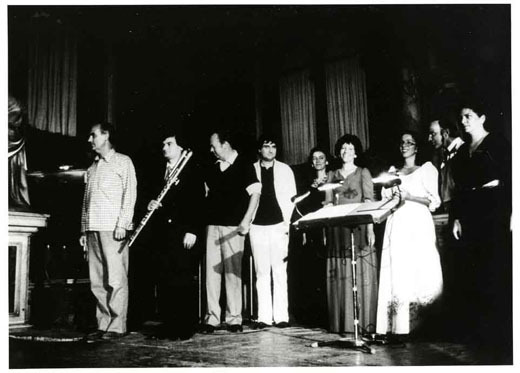 From left: Luigi Nono, Roberto Fabbriciani, Hans Peter Haller, Alvise Vidolin, Marie France Uitti, Ingrid Ade, Monica Bair-Ivenz, Halina Nieckarz, Bernadette Manca di Nissa. Venice, 1982. Luigi Nono was undoubtedly a very important personality for the Italian music scene though, as pointed out at the time and his great friend, the musicologist Massimo Mila, for many years it was run much as it boycotted abroad in Italy. Where did you obtain these? Hi Nicholas. Thank’s for your comment. I don’t remember where I found the three picture.